My sister, Brie, & I graduated with our bachelors degree in December of 2017. I have been itching to visit a country in Asia for quite some time now so we decided to go to Thailand to see what the hype is about! Pssst… Don’t forget to check out my guide on Island Hopping in Thailand. I will share my secrets on how to get a private long tail boat tour! Light weight cover ups for temples and restaurants. I brought several Kimonos because a lot of rooftop bars and temples had a strict dress code of no shoulders. Bangkok is extremely hot and humid in the summer months, so bringing a lightweight Kimono saved my life! You can browse colors and patterns here. A small bag that can be worn across your chest and on the front of your body. There are a lot of pick-pockets in Bangkok (well, any big city really). Make sure you are not wearing any flashy brands or backpacks – this makes you an easy target. This one is sooo cute and comes in tan and black! A cute but inexpensive pair of sunglasses! Remember, you will be at the beach. You don’t want an expensive pair to get scratched or stolen. This style is extremely flattering on most face shapes. Psst… I keep a list of all my summer essentials and favorite finds on this guide here. I am constantly updated it after every warm destination – tried, true & tested! Like, seriously long.. We spent a full 24 hours traveling there from Las Vegas & because of the time change, you lose an extra day. If you are traveling anywhere from the USA, your flight will be long and brutal. Make sure you find a good airline that provides free entertainment! Some back story first… My two main hobbies include making perfect itineraries (hence the blog name) & looking for flight deals! I have many flight tips, but the best one I can give you is make Google Flights your best friend! I found round trip flights from Los Angeles to Bangkok for only $430, YES you heard me! We flew Xaimen airlines (still do not know how to pronounce it correctly). We went into this flight extremely scared we were going to have a travel nightmare with flights that cheap, but this was the best airline I have ever flew on! They came around with FREE wine every 30 minutes, fed us 4+ times (not kidding), and had an amazing selection of movies! I would highly recommend this airline. Depending on what time you arrive, you will be fighting jet lag majority of the day. I would try to keep yourself as busy as possible by finding a good place to eat, swimming at your hotel pool, or catching the sunset at one of many rooftop bars. TIP: Uber is very popular and inexpensive in Thailand! You can catch an Uber from the airport to your hotel in Bangkok. There are many districts in Bangkok, so it will depend on the vacation style you are looking for. I stayed in Sukhumvit, because I wanted to be near the nightlife. I read several articles online that Bangkok’s traffic is horrid, so I tried to stay as close to the nightlife as possible. Finding a hotel in Bangkok can be extremely overwhelming because they are inexpensive and all 5*. I stayed at Column Bangkok Hotel, right in the middle of all the popular rooftop bars. This way, you are a short walk or Tuk Tuk ride away! It happened to be St. Patrick’s day when we arrived. Let me tell ya.. Bangkok is NOT the place to be for St. Patrick’s day. Only the tourists know that it’s even a holiday! We luckily found a tiny, hole-in-the-wall Irish pub that was packed with Irish travelers. Why they would pick Bangkok for St. Patrick’s day when they live in Ireland is just bonkers… but whose asking me? If we are being completely honest, we picked this pub because of the very inviting name…. The Drunken Leprechaun! Which I recommend this quirky bar at any time of the year. We were beyond jet lagged from our 24+ hour flight, so we went home after the live music ended so we would be fully rested for our first full day in Thailand. I always plan a free day the first day of a vacation, especially with that big of a time change, but most floating markets are only open on the weekends. There are so many good floating markets close to Bangkok – the ones we went to were just 30 minutes from Bangkok’s city center! If you are looking into going to a floating market in Bangkok, I am sure you have heard of the Damneon Floating Market. It is the biggest and most popular market in the area. We didn’t go there because when something usually reads “most popular” or “book one of the hundreds of tours,” we tend to steer clear! I wanted to go to a floating market to get a feel for the authentic Thailand culture, not a big tourist trap of overly priced souvenirs. Instead of touristy Damneon, check out two smaller markets: Khlong Lat Mayom & Taling Chan. These markets are completely different from each other and only 5 minutes apart. Start at Khlong Lat Mayom, which is was more of a food market, so definitely go to this place hungry! Spend the day wandering the alleys, buying souvenirs and taking a long tail boat tour through the neighboring canals. You can either go on a large boat tour with others or hop on a private tour. We asked a local where we can go on a long-tail boat tour and he took us around to a back alley to get on our “private tour.” Our “excited to be in a new country” selves were sold easily and we hopped in. As he started to pull away from the market into the neighborhood canals, we I began panicking realizing we were heading to our voluntary kidnapping! Luckily we had a trusty guide that brought us back to the market in one piece, with flowers he picked from a garden too! We next went to Taling Chan. This was not so much a floating market, but more of a market next to a river. Still beautiful, but no one selling goodies on boats! **TIP: Uber, Grab and Taxis are all very easy to grab at these markets. We always had phone service and transportation without a rental car was never an issue. Spend your night going to one of Bangkok’s many rooftop bars! If you are staying the “rooftop bar central,” AKA Sukhumvit, check out my guide on 9 best rooftop bars! Day 5: Finally, your free day! Spend the morning grabbing coffee at a local cafe, relax in a fish pedicure salon and head back to your hotel to spend some time in the sun! We stayed at The Column Hotel and it was luxurious! Very cheap and the rooms were outrageously huge. They served free breakfast and had a dreamy rooftop pool that was hard to leave. Day 6: Temples, Temples Temples! The temples are located within walking distance of each other and can easily be done in a day. The architecture of these temples are outstanding and will make the large crowds and heat completely somewhat bearable! The thing I looked forward to the most out of this whole trip was going to the Grand Palace. I get mad all over again while typing this, but the King comes at unexpected times and will shut down the whole joint! I stood in front of those giant gold gates for 10 minutes before reality hit me that I was never going to be let in. TIP: Plan your temple day on one of the first days just in case it is closed, that way you at least have the opportunity to go another day! I want to mention before writing anything else: BEWARE of scammers! I have never in my life seen so many people trying to scam you. And boy, are they tricky! We were approached by many English-speaking men dressed in suites that tell you that all the temples are closed for another 2 hours! Then they show you to a tour that lasts two hours that you can do in the mean time. This is all a scam, the temples are not closed (except the rare times the king is there, like our unfortunate time, meh). TRUST NO ONE IN THE OLD CITY, SERIOUSLY! Take an Uber or taxi to the old city and start with the Wat Arun temple that is across the river – The ferry to get across is only ~$0.04! This temple is gorgeous – all white with hand-painted ceramic detail. This is the most picturesque temple out of all of them. The several sides and winding staircases makes it extremely easy to snap a picture without anyone in the background. Nearby you can check out the reclining Budah, which is.. eh. If you’re already down there it’s kind of a “why not just stop in,” kind of site. TIP: Wear socks! You must take off your shoes to enter the temples and a bunch of sweaty tourist feet is NOT something you will want lingering on your feet! On your way back to your hotel, you can wander around Pak Klong Talat Flower Market and get yourself some beautiful flowers for your room for only $0.10! This is reason #2 why you should do the temples towards the beginning of your stay in Bangkok, so you can enjoy your freshly picked flowers. Day 7: Off to Phi Phi Island! Phi Phi Island is an extremely popular destination, for good reason! 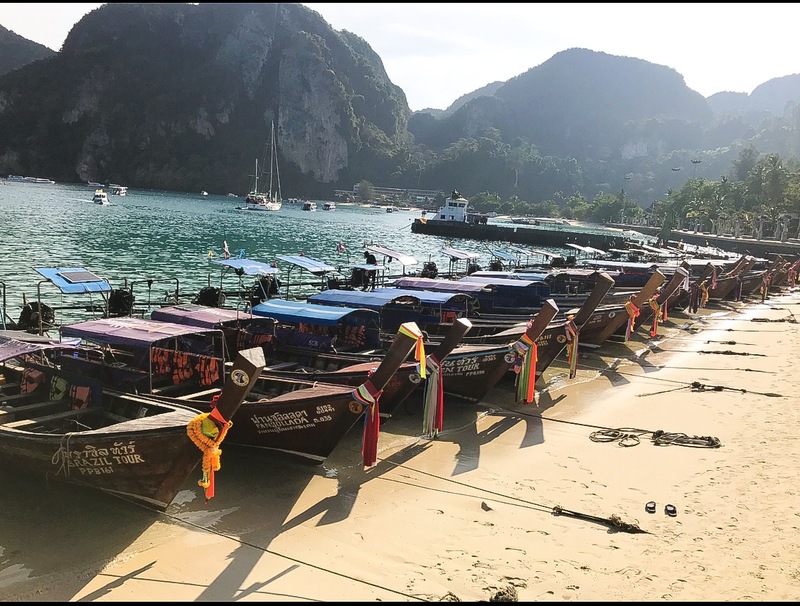 You are surrounded by limestone cliffs, golden sand, warm water, long tail boats lining the shore, and monkeys in the trees! Tourists started to flood here after the movie with Leonardo DiCaprio, The Beach. In this movie, they show many shots of the nearby island and famous bay, Maya Bay. You can access this bay very easily from Koh Phi Phi, which brings a lot of tourists to stay here. Catch a flight from Bangkok to Phuket in the morning, so you have enough time to reach the ferry terminal before it closes. Ferries run every 2.5 hours starting at 8:30am to 3pm. You can purchase the ferry tickets when you arrive, but if you are traveling for a major holiday or event, I would book them in advance. You can take a look at the ferry times here. TIP: Don’t plan on taking the last ferry out in case your flight is delayed or you miss the ferry. I would plan to reach the ferry for the 1:30pm departure time. We stayed at Phi Phi Cliff Beach Resort, which was amazing! They had a private beach, free breakfast, infinity pool, free boat ride from the pier, and the rooms were beautiful. You are nestled up in the cliff and can actually hear the monkeys talking to each other. Once you are checked into our hotel, hike up to Phi Phi viewpoint for sunset. This is the thing to do at sunset because the whole island will be up there! I promise you it won’t feel like a typical overcrowded tourist spot, but rather a social event! Everyone will be blasting music, drinking beer, and meeting other travelers from all over the world. From this viewpoint, you can see the unique shape of this island. Saddle shaped with two mountain points and a narrow beach going along the center. The water on each side of the island will be a completely different color due to the depth and light reflection. TIP: Bring money!! They charge about $2 USD to enter the viewpoint. There were a lot of angry travelers who hiked up the mountain only to find that they had to pay and were turned away. Once thing that really surprised me was the nightlife in Phi Phi. I am from Las Vegas and boy does this island know how to party! Every daytime restaurant turns into a nightclub that merges with the restaurant next to them. There are no cars on the island so just walking the streets is like a big party. I highly recommend checking out Slinky’s beach club and fire show, this place was crazy. I have a lot of details and tips on this day so I decided to make a separate blog post. If you want to know the details of our private long tail boat tour, click here! Day 9: Phuket here we come! Before heading to your next stop, start your morning with $7 (USD) Thai massages right on the beach! These can be located along the main beachfront. You will see huts with Thai ladies begging you to come in for a massage. Be prepared for another long travel day. I know this will be exhausting in the moment, but this itinerary allows you to see so much of Thailand in such a short amount of time. Take the same ferry back to Phuket, catch a ride to Patong Beach area, and arrive at your hotel. I highly recommend staying at my favorite hotel/hostel to date: LubD Patong Beach. This place is adorable with the best vibe! When we checked into the hotel they were doing lobby karaoke and announcing their 25th sign up for the bar crawl that night! All the staff closed up the bar and joined us on our night out on Bangla Road. This place is seriously crazy – the only way to describe it is Las Vegas without any rules, ha! Phuket is home to the oh-so-famous Patong Beach. When I went, we were not there long. Seconds after you lay down your towel and begin relaxing on the beach, you will be bombarded with locals trying to sell umbrellas, sunglasses, aloe – you name it, they were selling it! If you plan to stay at LubD, they have events and pool parties almost every day. Grab yourself a “Thai Bucket” at either the hotel bar or beach bar and make some new friends from around the world! Pack your bags and sadly leave the sparkling ocean behind! I would highly recommend cutting out some time in Bangkok and spend an extra day (or five) on Phi Phi Island. We went in March and the weather was perfect with no rain. If you can stay longer, do it! The travel time in between destinations is long and brutal. Enjoy each stop as long as possible! This is such a great guide when we visit Thailand in the future. Thank you for sharing. Wonderful photos, too. Looks like an amazing trip. Thank you, I hope you find it useful for your future travels! Did you fly back from Phuket to Bangkok and then to LAX? Or go from Phuket to LAX?